This week I've been focusing on two projects. 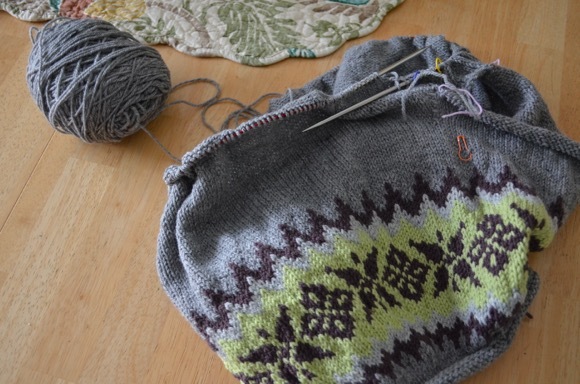 I'm adding inches to the body of the fair isle sweater and love the mindlessness of stockinette stitch. So much fun! Mindless knitting allows me to read a book or watch TV and I have minimal mistakes or if I'm lucky no mistakes. Never say never. My yarn choice for the fair isle sweater is Quince and Co Chickadee which is pure delight to knit with. I love the dark gray with a bit of tweediness spun into the wool. My other project is a pair of simple socks for my husband. The pattern is burned into my memory and really old. I usually do a 2 1/2 inch cuff then switch to stockinette (mindless!) for the rest. This sock yarn is slightly thicker than regular yarn so there's some heft to the sock. I think he will love them when I finish them. This project is my 'grab and go' project. Car rides or babysitting, I've got everything in a project bag ready to grab and go. What are you knitting or making this week? I am working on a shawl, cowl, and just cast on a hat. The hat has a deadline, so I had to run out to grab the yarn I needed to work on it! Chickadee is on my bucket list of yarns! (I've only knit with Quince's linen, so really, ALL of their wool yarns are on my list.) Love those socks ... I'm sure your husband will, too! Blankets and a pair of socks for Steve that are just down to the heel flap on sock number one. The grey and yellow of your sweater are so pretty. That's going to make a nice go-with-everything sweater. Those socks are a great combination of colors! I'm working on baby hats and Sockhead cowls, both lovely round and round knitting. Love both your projects. There's something about grey and yellow. And the sock yarn is just plain happy. I'm working on (or will be once I graph out the design) a cowl for my husband and plan to cast on some new socks soon! Oh, I love the colors in that sock yarn! I used to knit socks all the time, especially as my "grab and go" project, but I haven't done as much the past few years. I did cast on some socks this weekend though! I have lots of little projects, almost finished two crochet shawls. I am working on a crochet blanket and sewing some tableware. I love the colors of the sweater! You're moving along quickly! Love your projects right now. Love mindless knitting. Those socks are great colors. That is one, lucky husband. 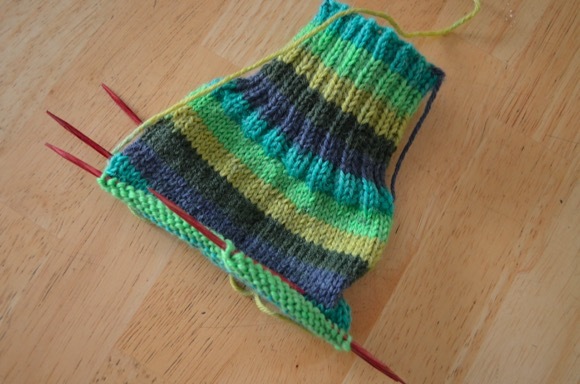 I once knitted shorties for my husband and they seemed to take forever since his feet are much longer.